In preparing this blog post I’ve turned to my go-to source for inspiration: my iTunes library. There are certain artists whose music gets me in a great frame of mind for writing and thinking creatively. There’s Norah Jones, whose charming voice, superlative musicianship and simple, elegant songwriting are always inspiring and soothing. There’s Marie Digby, an artist who became a YouTube sensation with sweet, acoustic covers of pop hits by the likes of Britney Spears and Rihanna (Digby’s full-length album Unfold is lovely and worth a listen). 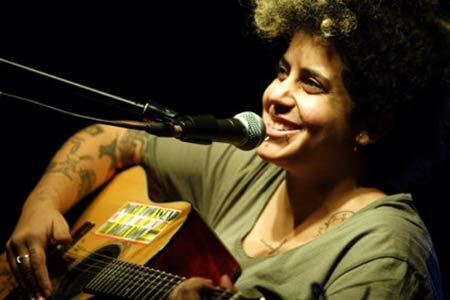 But today I’ve click-wheeled over to another of my all-time favorite singer- songwriters, Kimya Dawson. She’s an artist who keeps a special place in my heart for a number of reasons. I fell in love with her music like many folks did—by watching the film Juno and downloading, buying or borrowing that film’s wonderful soundtrack, featuring solo songs and songs from her work in The Moldy Peaches. Her voice is earnest to the point of being childlike, her guitar-playing is folksy and unadorned and her lyrics are honest, open and plain-spoken with the occasional well-placed eff-bomb to drive home a point (her song “Loose Lips”, with her eviscerating anti-war message is a great example). Usually when I reach for the Kimya Dawson albums, I lean towards her 2006 album Remember That I Love You. Today, however (perhaps in fit of thumb-clumsiness) I happen upon her 2008 album Alphabutt. Many reviews and articles about this album refer to it as a children’s record and I suppose it is (even though my iTunes library categorizes it as folk). It boasts a lot of incredibly creative, kid-friendly tunes like “Little Monster Babies”, “Bobby-O” and its title tune, a scatological masterpiece. But there is also the gently passionate and political “Sunbeams and Some Beans” which ends in a profound yet down to-earth flurry of lyrics that I’d like to quote right now: “if you only have one bean and you meet someone with no bean/ you should give them half your bean/ ‘cuz you will be less hungry if you eat just half a bean/ than if you eat a whole bean in front of somebody with no beans”. 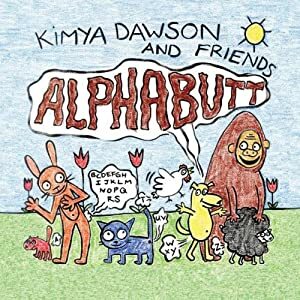 The beauty of Kimya Dawson is that she’s brilliant in speaking to the child in every adult and, as in Alphabutt, she gives a nod to the adult in every child. I could write a blue streak about some of my favorite works of hers—”My Mom”, with Dawson confronting her mother’s harrowing battle with cancer and the existentially astute “I Like Giants”—but I’d rather you click here for a great tune from Dawson’s 2011 album Thunder Thighs (doesn’t look like the Library has this album but it’s wonderful). I love Kimya Dawson too!